Sunday June 12th 1881. I did not feel like going to church this morning but helped with the dinner and in the afternoon took a good sleep which rested me very much. I had promised May to take her over to Hatties in the afternoon but it came on to rain very hard so we could not go. Mr Eggleston from Burlington called in the afternoon. 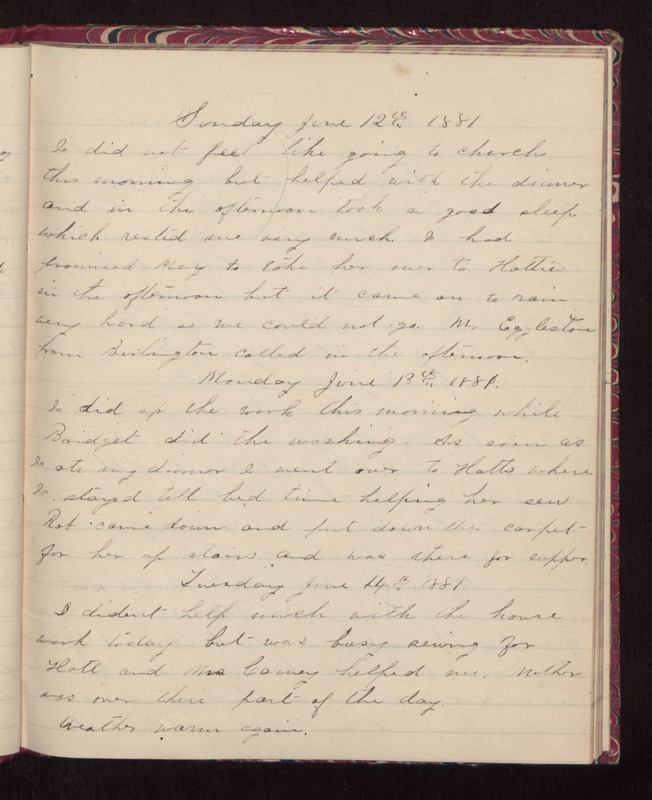 Monday June 13th 1881. I did up the work this morning while Bridget did the washing. As soon as I ate my dinner I went over to Hatts where I stayed till bed time helping her sew. Rob came down and put down the carpet for her up stairs and was there for supper. Tuesday June 14th 1881 I dident help much with the house work today but was busy sewing for Hatt and Mrs Carney helped me. Mother was over there part of the day. Weather warm again.